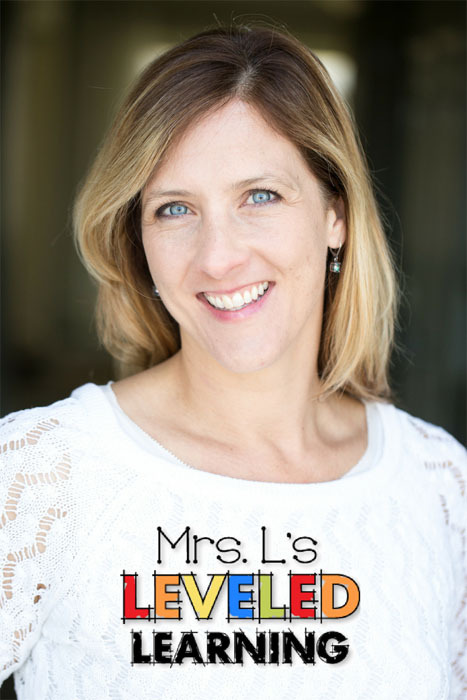 Are you struggling to find engaging review activities for standardized math testing? As a visual-spatial thinker, I always found geometry really fun and easy to teach because I could SEE what was being described. The biggest challenge for my to my 4th and 5th grade students was the vocabulary! Understanding how the visual representations translate into verbal descriptions, and the huge array of terms for every figure, can be a struggle to memorize. I decided to have my students engage with the vocal by using their imaginations and artistic abilities to create Geometric Kingdoms! Translating words into visual images really forces kids to think about interpretation and application. 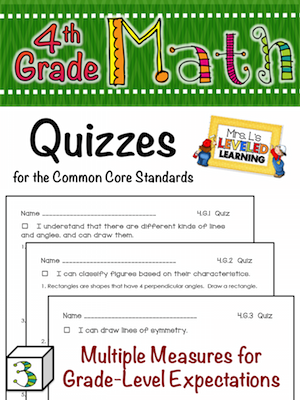 These higher order thinking skills engage their minds in ways that is enjoyable and educational. 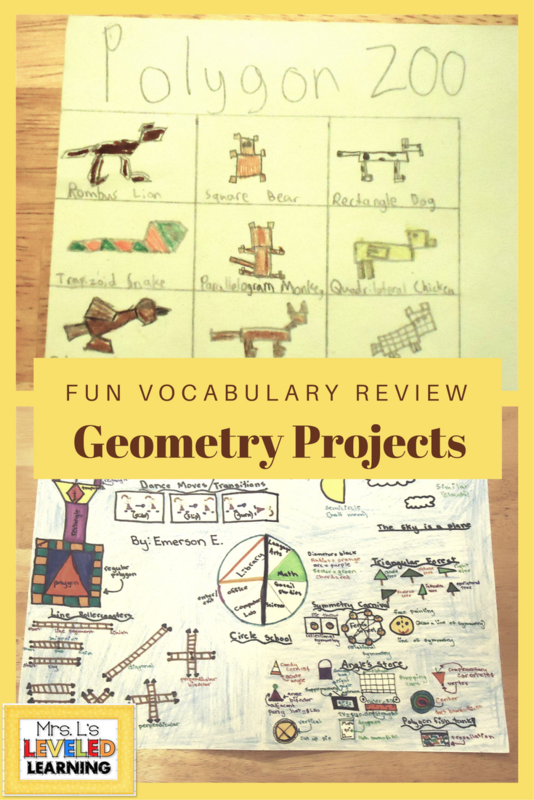 This project can be easily modified to focus on the specific Geometry standards for each grade level. 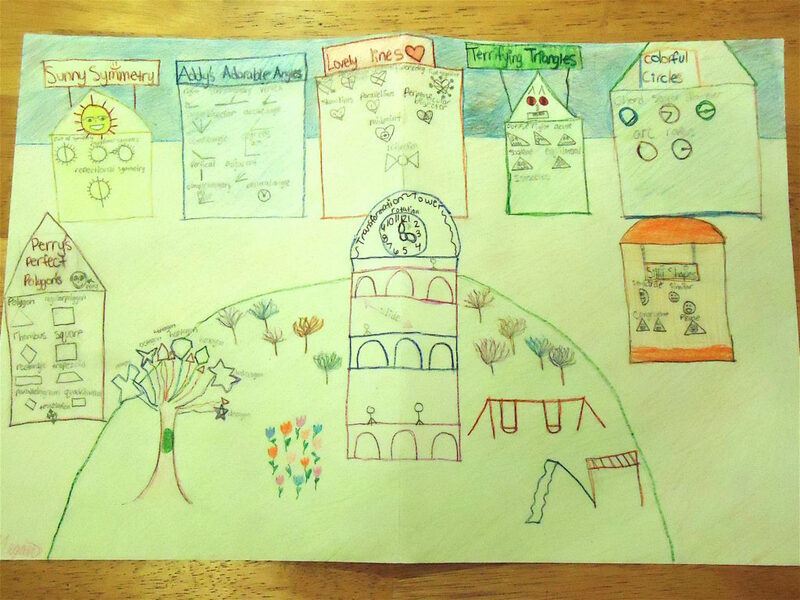 Here’s some examples of the creative outcomes! Read on for a description of the assignment. 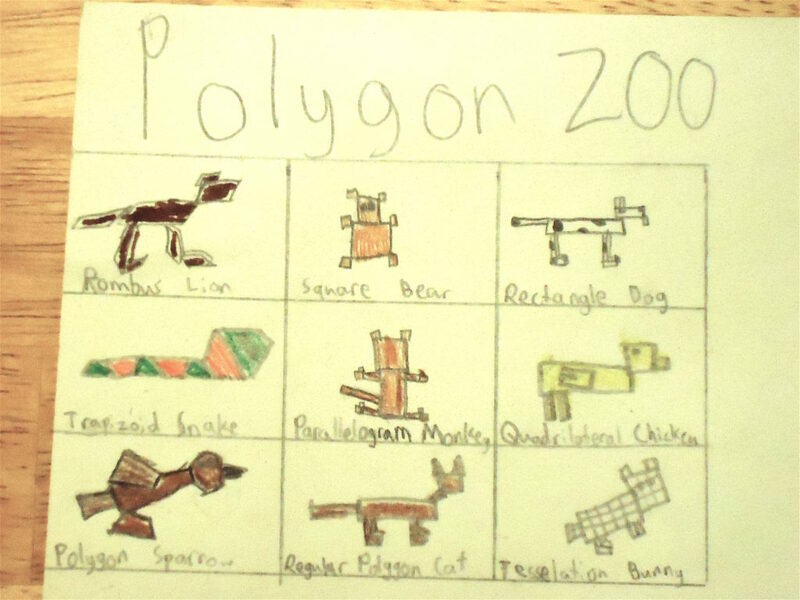 Create a map for your Geometric Kingdom, incorporating all of the geometry vocabulary listed below. SKETCH some ideas on the back of an 11×17 paper, and draw the final map on the front side. COLOR if you have time! Lines (9) ray, perpendicular lines, diagonal, line segment, intersecting lines, skew lines, parallel lines, perpendicular bisector, midpoint. Angles (12) right, supplementary, vertex, angle bisector, acute, obtuse, degrees, vertical, adjacent, complementary, straight, central. Triangles (6) obtuse, right, acute, scalene, isosceles, equilateral. Circles (5) chord, sector, diameter, arc, radius. Shapes (4) semicircle, similar, congruent, plane. Polygons (9) polygons, regular polygons, rhombus, square, rectangle, trapezoid, parallelogram, quadrilateral, tessellation. 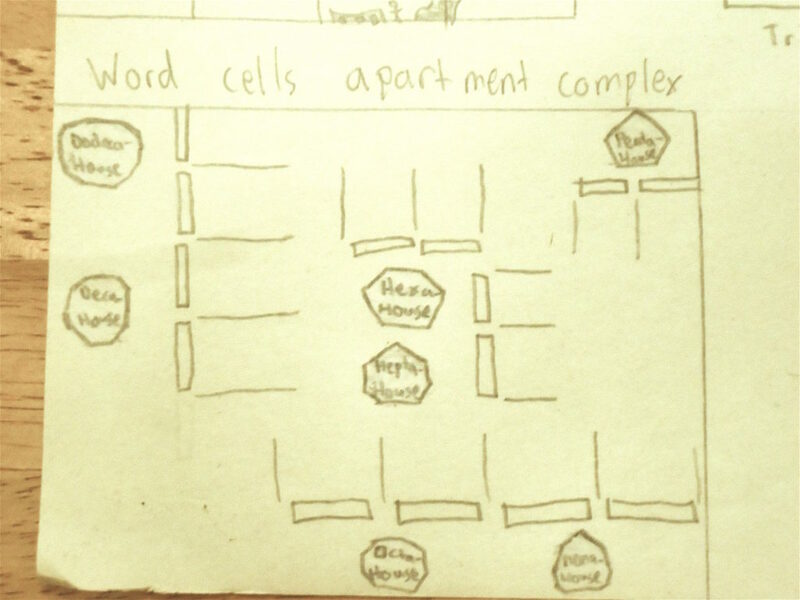 Word Cells (7) penta-, hexa-, hepta-, octa-, nona-, deca-, dodeca-. (The word cells can be applied to polygons –flat shapes, or polyhedrons – solid shapes). Feel free to use these ideas and modify it for your own vocabulary. 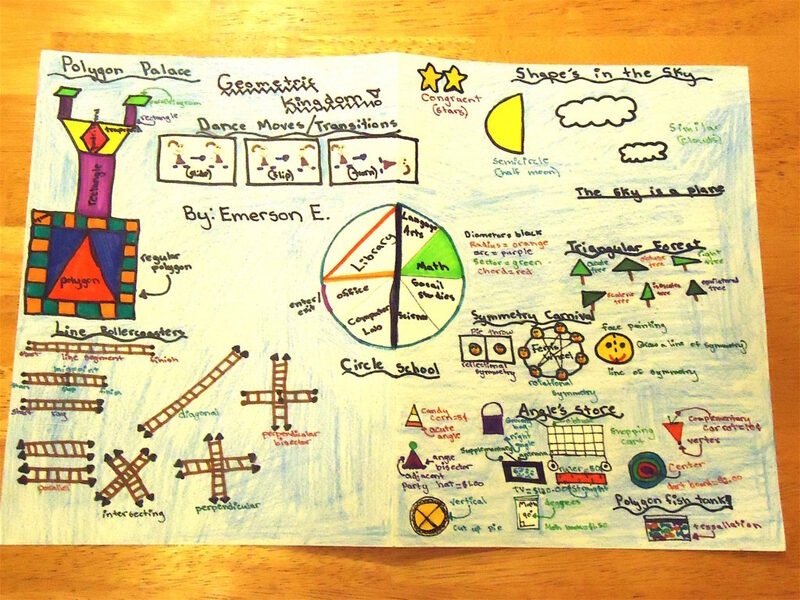 I’d love to hear your comments, ideas, or how you’ve used visual arts to review content in your classroom. Leave a message below!